In past years, Watershed Landcare has invited internationally recognised Dung Beetle experts to join our Landcare lecture program at the Mudgee Mudgee Small Farm Field Days. 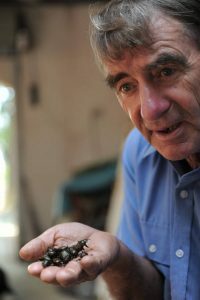 In 2011, we had entomologist John Feehan OAM (pictured left), known as the Dung Beetle Expert and also the Farmer’s Friend. John is a recognised authority on dung beetles in Australia and was a member of the CSIRO team tasked with introducing bovine dung beetles into Australia. In 2013, we had Dr Bernard Doube, director of Dung Beetle Solutions Australia (DBSA). Bernard is an international expert on dung beetles, earthworms and the biological basis of soil health who worked with CSIRO for 29 years and was OIC of the CSIRO Dung Beetle Research Unit in Pretoria, South Africa, for 7 years. 200 years ago, when Europeans introduced domestic livestock, they forgot to bring the right beetles! to date, 44 species of dung beetle have been introduced to Australia, with 32 of these now establised. These beetles work primarily on cattle dung, with only 2-3 species at their climatic limits.